Ultra Violet Cured CIPP Is one of the most sophisticated technologies to rehabilitate sewer systems. Glass reinforced pipe liners have become increasingly more popular and widely used as the industry grows and matures. Tests show that a fiberglass cured in place pipe lining solution is far superior to standard felt liners. The benefits of using UV cured CIPP liners are numerous and provide longer term benefits and results. Ultraviolet cured-in-place liners are the premium manhole to manhole liner on the market today. UV fiberglass liners have a higher reinforced strength and have thinner liner thickness which increases capacity and also protects against contaminants and water and resin mixing. 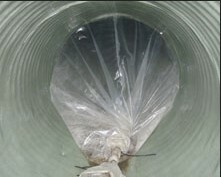 UV cured liners also eliminates peeling and pipe clogging and air entrapment in the liner. They are the most popular liner in Europe with over 15 million feet installed since 1992 and can be used for pipes from 4 to 60 inches with a service life of 50-80 years. UV liners can be used for road culverts, railroad culverts, storm drains, irrigation pipes, sanitary sewer pipes and force mains.